A relative newcomer to Flushing, the Dumpling Galaxy has every kind of dumpling you can imagine, and they’re all fantastic. Situated in the back of a sleek new shopping mall, the Dumpling Galaxy has large and small tables, as well as a number of booths which have an arresting slideshow of delicious dumplings playing on a video screen on the back wall. 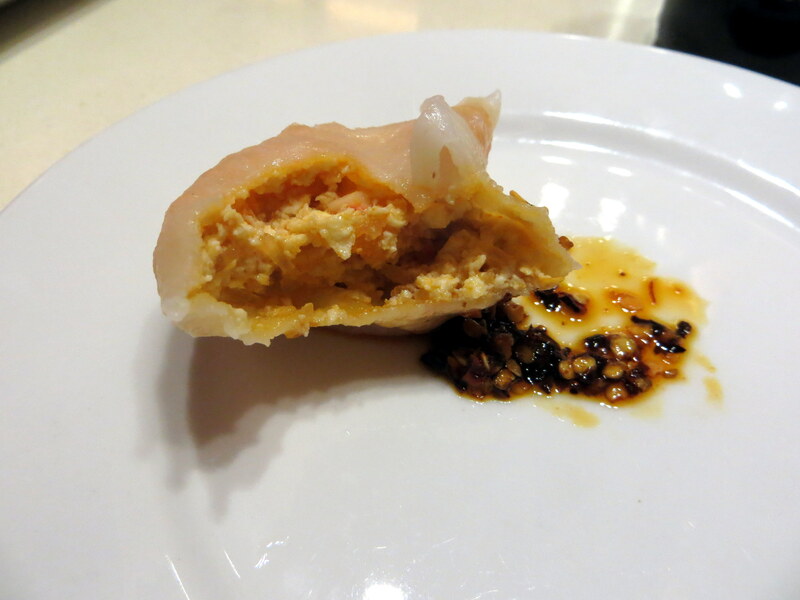 Fillings range from the expected pork and chive to the novel tofu and crab roe (pictured), and include interesting vegetable fillings like bitter melon, long bean, green squash, and broccoli. Be sure to try the fried dumplings, which are gently pan fried into a star shape, with a thin, completely addictive, crispy layer of starch connecting the dumplings. I strongly recommend anything with cilantro, the lamb and green squash dumplings, and the shrimp and celery pan fried dumplings, but you really cannot go wrong with any of the dumplings on the menu. The dumplings are made to order, so they take a little time to arrive at the table, but you’ll be too mesmerized by the dumpling slideshow to notice. If you can’t find your favorite dumpling combo at the Dumpling Galaxy, you might want to visit its equally tasty but less glamorous sister restaurant, Tianjin Dumpling House (Golden Shopping Mall, 41-28 Main St, Flushing, NY 11355). Four words: make your own dumplings. But without the pesky cooking part. You can request a mix of proteins, vegetables, and herbs from their list, and within minutes you will have your own plate of custom dumplings to enjoy at the counter surrounding the small kitchen. There are a number of excellent food stands in the delicious, if dingy, Golden Shopping Mall, and I’d also recommend Lam Zhou, next door to Tianjin Dumpling House, for hand pulled noodles. A rite of passage in New York is eating street food. 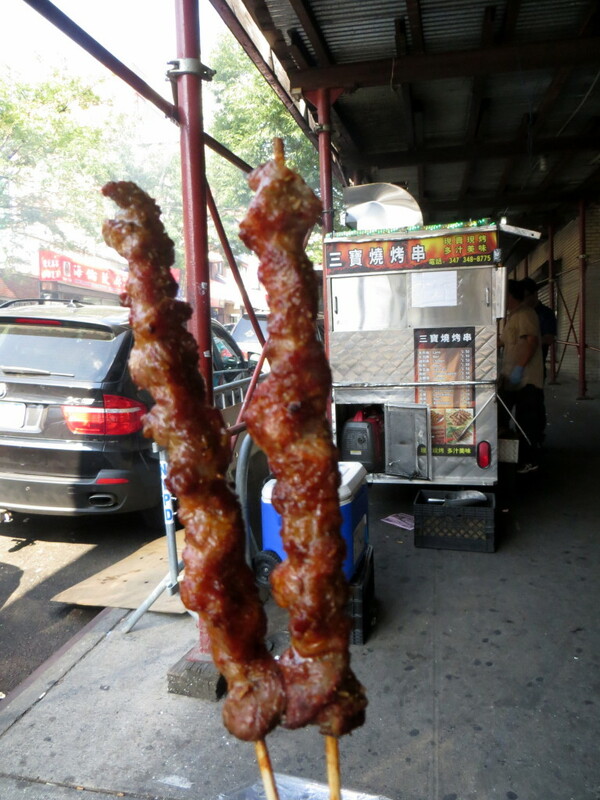 Uighur cooks from Western China have been treating us to their grilled meats for a few years now in Flushing, and it’s easily one of the best bargains in the city, starting at $1.50 a skewer. While the lamb is by far my favorite, the chicken, beef, and quail are all delicious. Be sure to say yes to the hot sauce! The stands on Prince and 39th Street and Main Street and 39th Street have similar menus and prices, and are equally good. For those who are looking to fuel up before heading to the venue, there’s no better choice than dim sum. Flushing has a wide variety of establishments serving the morning meal of tea and dumplings. The best variety of dishes, including dumplings, roast meats, vegetables, noodles, seafood and desserts, all served from roving carts of deliciousness, tends to be around noon on weekends. But, those who are looking for a savory breakfast on a weekday morning will still have plenty to choose from, in the company of groups of regulars hanging out over their tea. My favorite Flushing dim sum restaurants are Asian Jewels Seafood Restaurant (13330 39th Ave, Flushing, NY 11354) and Jade Asian Restaurant (136-28 39th Ave, Flushing, NY 11354). About halfway between the USTA Billie Jean King National Tennis Center and Manhattan on the 7 train is the fascinating multi-ethnic neighborhood of Jackson Heights. Walking a few blocks in any direction, you can find restaurants from Nepal, India, Ecuador, Mexico, and many other countries. One of my favorites is the Arepa Lady, named after Maria Piedad Cano, a former lawyer and judge in her native Colombia who has become a beloved New York institution. Anointed the “Sainted Arepa Lady” by Chowhound.com founder, Jim Leff, Cano’s arepas, or corn cakes, both the cornmeal and whole corn kernel varieties, are the buttery, cheesy stuff of urban legend. After leaving Colombia amidst its political turmoil of the 1980s, Cano came to New York with four young children and needed a job with flexible hours — she was introduced to the idea of a food cart, and New York has been benefiting from her career change ever since. For many years, the only way to get the arepas was to find Cano’s cart under the 7 train tracks at 79th Street after midnight, but thankfully her children, now grown, have established this sleek, little restaurant to capitalize on the popularity of their mom’s food, and to give her an alternative to manning the cart in the wee hours (though she is still going strong many nights at the cart). In addition to arepas (stuffed or with a variety of toppings), they also serve patacones (fried plantains with toppings of your choice), and a selection of fresh juices charmingly served in Mason jars, including the delicious maracuya — or passionfruit — pictured above. 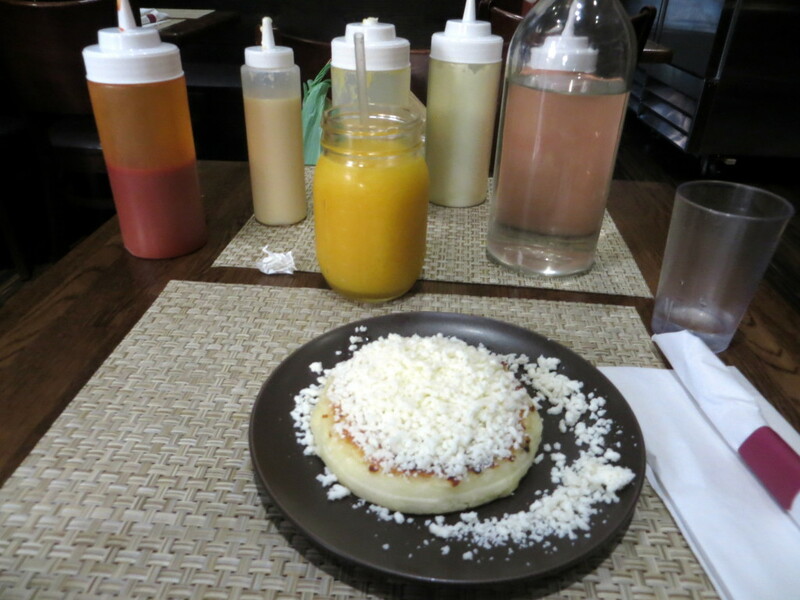 My favorites are the arepa de queso (pictured), a filling gooey disk of corn flour, mozzarella cheese and butter, topped with white farmer’s cheese, and the arepa de choclo, which is made from fresh corn kernels. Chances are, after attacking the rest of this list, a fruit interlude will probably be welcome. 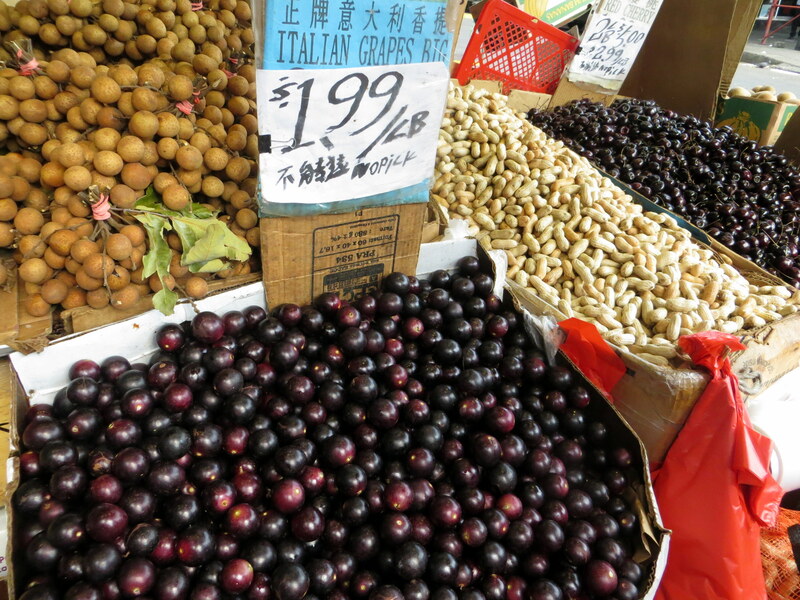 Luckily, Flushing has a broad selection of grocery stores and stands, most of which stock a number of exotic fruits. Whether it’s the spiky rambutans or the crisp, watery Asian pears, there’s no end to the things you can try out. An added bonus is that it is possible to take limited amounts of food into the USTA Billie Jean King National Tennis Center, so it’s a good idea to stock up on some fun fruit while in Flushing to snack on throughout the day. My personal favorite are the Muscadine grapes (pictured), known in the southern U.S. as “swamp grapes,” and sometimes labeled as Italian grapes. Tangy, with a thick skin and seeds, these grapes, like the tennis, only hang around New York from late August through early September, so get them while you can. This is really just the tip of the tip of the iceberg when it comes to trying out all of the amazing food in Queens. For those who are looking to find more culinary treasures, be sure to check out the always excellent recommendations of Chopsticks and Marrow, as well as Serious Eats’ Flushing archive, and I’ll be sure to document my culinary adventures on my Instagram.